Couldn't filla a floor if your life depended on it. Every once in a while, an event happens that is so spectacular and stunning, you simply cannot believe that it could have happened. In 1903, the first successful human flight took place in Kitty Hawk, North Carolina. In 1969, Neil Armstrong was the first man to walk on the Moon. In the late 1980s and early 1990s, the world saw the fall of communism. And those are just the ones with a positive impact; there are indeed numerous failings in human history that can equally take one's breath away. These events captivate the heart and tickle the mind. Floorfilla's debut album, "United Beatz of Floorfilla", is not one of them. Let's start by looking at the COVER of this damn thing, shall we? It's the drawing of a six-year-old DJ, likely drawn BY a six-year-old, except everyone in the background is giving us the middle finger, as though to say, "Ha ha, you just bought a terrible album. You deserve this as your reward." Sad thing is, that's the official Floorfilla mascot character that appears on most of his early singles and albums around that time, up until about 2007 when he decided not to put any more music out for a while and give that little offensive character a break. Even the liner notes of the album, as well as the disc itself, is littered with cartoon crowdsfolk flipping us the bird. If it's done on a heavy metal or grunge album cover, it's meant to serve as a way of disassociating themselves with "the system". If it's done on a eurodance album, they're only rebelling against proper finger use at concerts. All terrible covers aside, at the end of the day, it's really about the music. Let's start out with Enter The Arena (Est-Ce Que...! ), the opener and the longest track on the album. I should mention that although Floorfilla is an Italian artist, there's a heck of a lot of English and French floating around, usually done by an MC called "Momo B", who sports a dreadlock ponytail about four feet long and nothing else. Reminds me of Yoji Biomehanika, just with significantly less orange hair dye. Anyway, I was talking about a song... Momo B asks us "Est-ce que vous êtes là?" with some pretty standard eurodance bass and squeaks. Nothing offensive yet, at least until we get to the main melody, played using a fake trumpet synth to mimic the grandeur of the stadium. If you don't mind the cheesy-sounding trumpet, this one's actually tolerable. Maybe that's why he placed it first. Floorfilla is known for his many anthems, and so it's only makes sense to start with Anthem #4, right? Right? The heck with numbers, let's just party down! While the beeping melody is forgettable, it's those goofy repeated samples of "Check that body!" and "Move this party!" that are far more memorable. Unfortunately, that's not enough to declare a song an instant smash hit. Anthem #4 would easily blend in with a generic dance hit compilation disc, but on its own, it's nothing special. We're only two songs in, and already we need an interlude in The Match. Two songs in a row is just too much for me. It's basically a minute-long vignette about the guys involved in Floorfilla playing table tennis, and we have to hear their respective matches alongside the sound effects of a ping-pong ball being smacked back and forth. Why am I wasting my time listening to this? It's neither funny nor entertaining, and that audio space could have been used better... by silence. Uh-oh. A dark voice indicates that we are now entering the dark side of Floorfilla. That's a bit frightening, but perhaps we'll hear some more mature tracks! I kid you not, the next track is called Cokemon (Cokane Monsterz). Let that awful title sink in for a bit. This one's another characterless song with only one memorable feature, and it's not a flattering one: there's a sample that repeats over and over that — and I swear this is true — sounds as though it's saying "I'll do this n***** s***". So now we have a song supposedly about collectable creatures that ingest drugs which also recurrently drops the N-word. Hmmm. I guess I can now strike Floorfilla off my list of idols. Who's left now? Cool. Okay, perhaps The Hypno can hypnotize us into being a little happier. But here's the thing: aside from some knocks on a fake wood block and some squeaks, there isn't much substance to this track. To add insult to injury, the song shouldn't even be called "The Hypno", because the voice sample that gets repeated says, "There's no ifs, no ands, no buts." It's "ifs-no", not "hypno"! At least there's a little redemption with Mr Q Screams Out, a bit more of a dark breakbeat number with rhythmic squelches reminiscent of Daft Punk's early track, "Rollin' & Scratchin'", equally abrasive but a touch more acidic. The song's not very long, but it's refreshing to hear a change of pace from Floorfilla, whose floors are not getting filla'd very quickly. I'm not sure why there's a strange preaching sample about the black agenda in the middle of the song. Who IS Mr. Q, anyhow? Anthem #3 is one of Floorfilla's bigger hits, especially in France, but it's actually one of his cheesier productions — and that's an accomplishment. The fake trumpet is back to scream out an underwhelming melody, although I'm sure people would go nuts for a track like this at the Summer Olympics for its plastic majesty. But once that's over... Yo, yo, yo, yo, YO! Momo B is back with Le Son De Floorfilla, a French rap/dance track that is apparently Floorfilla's signature sound, if the title is to be believed. It's... not horrible. It got my head bobbing a little bit. 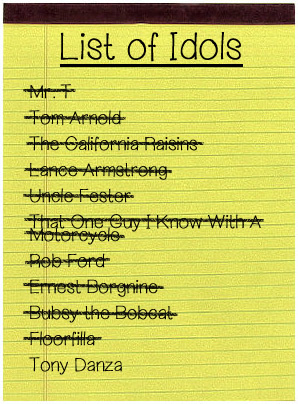 I have to give credit to Momo B: he may be a little trite, but he makes Floorfilla's songs better. The choice for the new generation. P.S. I was joking about the million dollars. But now, let's sit back, relax with a fine wine or bowl of corn puffs, and enjoy A Night In Europe, featuring a song made in about ten minutes with a really lame, dry, and in-your-face melody. Highlights of this song? Occasional female groans, and pushing the Skip button. And... what's this? We get Floorfilla's answering machine? Looks like we have to sit through The Message, where someone leaves the most useless message known to man, basically saying they're in the studio making decent music, followed by a charming, polite closing of "F*** you." I feel a Grammy coming on, Floorfilla! With Anthem #2, a high-pitched voice croons, "This way, I can't fail..." Listening to the song itself, I'm thinking our little cherub might be wrong. While nothing spectacular, it does lend itself to being in a high-energy DJ set back in the late 1990s. Anthem #2 does suffer from the same fate as the other anthems: the goofy vocal sample he uses is the only memorable part. We're in the home stretch, though, with Jump India!, featuring some subtle ethnic percussions and... is that a fake flute or piccolo screaming out at us? I think it is! There isn't much variety in this track, although his addition of an extra sharp saw bass doesn't hurt. In the end, this is still another in a string of forgettable songs, though. Last up is Anthem #1, the song that may have started the unduplicable adventures of Floorfilla. It starts out more promising than the others with a slightly more heartfelt than usual piano theme before leading into a far-more fleshed out hard dance tune than anything else produced on this album. Nothing is as complex as what's here — not that this another is tantamount to Beethoven or anything — but frankly, Anthem #1 is arguably his best work on here. The word "cheese" is thrown around a lot when it comes to dance music from this era. 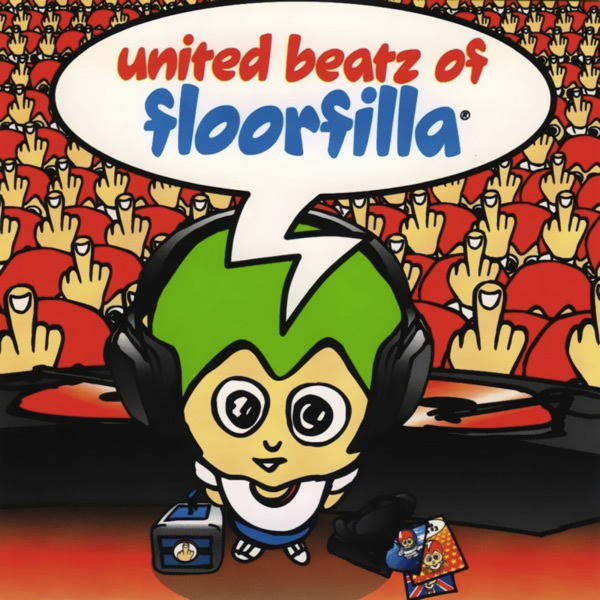 I think Floorfilla's "United Beatz of Floorfilla" is the poster child for that term. Most melodies are throwaway, and there is an impressive amount of filler— er, sorry, FILLA on here. The guy may very well have had a couple of moderate hits and then pasted together an album too quickly to capitalize on the popularity. But it failed, and it failed hard; what we got is a release stagnant of ideas. Maybe I should be the one holding up the wrong finger. ...No, I'll keep it classy.